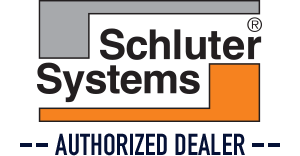 North Shore Bathrooms is proud to announce that we are now an authorized Schluter Systems Dealer. As stated on their website, Schluter Systems is committed to providing innovative ceramic and stone tile installation systems. Their unique approach ensures quality and durability all in a maintenance-free design. We are proud to carry and appropriately install top quality products. As part of this commitment, we have invested considerable resources in making sure all our products meet or exceed Schulter and industry standards. Check out Schluter Systems today and see how this addition to your home can make a real difference in terms of beauty and reliability!